Huntington’s disease (HD) is a dominant autosomal monogenic disease whose pathophysiological basis comes from a mutation in the huntingtin (HTT) protein. HTT is one of the proteins whose gene has a polymorphic CAG trinucleotide repeat tract, leading to the formation of polyglutamine tract in the N-terminal region of the protein. The expansion of CAG repeat is the basic characteristic of mutated huntingtin (mHTT). HD is therefore characterized as one of the polyglutamine diseases (PolyQ). The initially apparent main symptoms are motor changes, with choreic movements, progressive loss of motor coordination, cognitive decline, and psychiatric disorders. 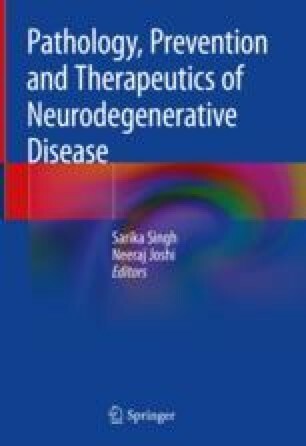 The pathophysiology of this disease involves a wide range of biological mechanisms, whose alterations culminate in gliosis, with loss of astrocytes and oligodendrocytes, and in neuronal death and atrophy of brain tissues, with the most affected regions starting with the striatum, which integrates circuit of the basal ganglia and the cerebral cortex. Medium-sized spiny projecting neurons which release inhibitory γ-aminobutyric acid (GABA) neurotransmitter are the most affected, but many other neurons and neurotransmitters are involved in the circuit dysfunction. Among biological alterations inherent or consequent to the dysfunctions in the neurotransmission system are cellular inclusions of protein aggregates, changes in cellular signaling pathways, energy metabolism, oxidative balance, and inflammatory mechanisms. This chapter discourse some well-defined basic pathophysiological features and some mechanisms that are the most recent study objects in HD.